With the advent of accessible digital technology more than a decade ago, international development organizations began seeking new ways of including digital tools in their programming for improved outcomes. These efforts were initially quite successful; significant advancements occurred in various sectors such as health and agriculture, more communities around the globe were connected, and underserved populations were reached in a way that had not been possible before. However, some digitally-enabled programs failed – and quite often that failure was for reasons that were both predictable and preventable. The Principles are not meant to be stagnant, nor compulsory. They are a set of living guidance intended to help practitioners succeed in applying digital technologies to development programs. Over time, the Digital Principles may change as they are updated and modified to fit specific contexts and environments. The Digital Principles community plays a key role in ensuring the Principles are still relevant and useful. If you would like to learn more about what other practitioners are doing to implement the Principles, or join the discussion, please visit our Community page. What are the Principles for Digital Development? The Principles for Digital Development are nine living guidelines that are designed to help integrate best practices into technology-enabled programs and are intended to be updated and refined over time. They include guidance for every phase of the project life cycle, and they are part of an ongoing effort among development practitioners to share knowledge and support continuous learning. The Digital Principles were created in a community-driven effort, the result of many lessons learned through the use of information and communication technologies (ICTs) in development projects. All are encouraged to use them. From Principle to Practice: Implementing the Principles for Digital Development is the culmination of rich and detailed discussions about these Principles by more than 500 individuals representing over 100 organizations working in international development. The report captures their experiences, insights, and questions and presents a set of recommendations about how we can chart a path forward in digital development. Who created the Principles, and when? In the late 2000s, donors and implementing organizations began to recognize that digital development programs were fragmented, uncoordinated, siloed, and struggled to scale or sustain themselves in the long term. To address these challenges, donors and implementers began discussing how to understand and share best practices in the use of ICT tools in international development. 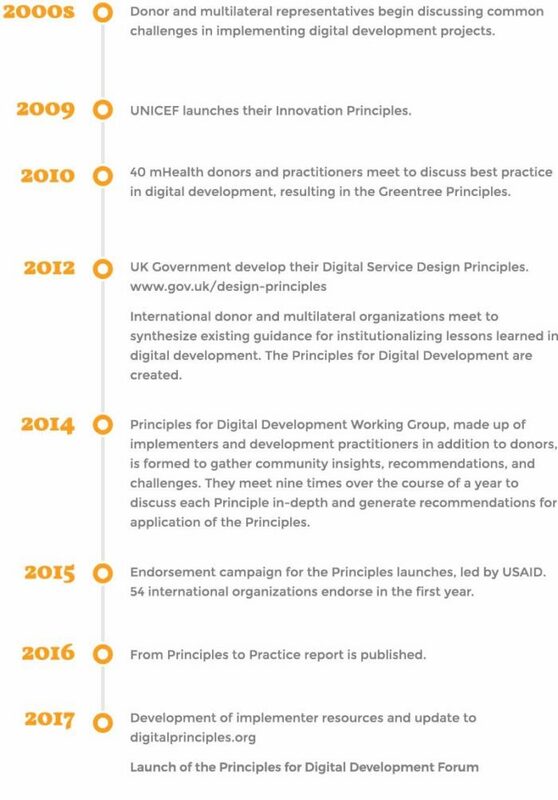 These conversations led to the UNICEF Innovation Principles of 2009, the Greentree Principles of 2010, and the UK Design Principles, amongst others. The Principles for Digital Development are an attempt to unify those previous principles and create a community of practice for those who work in digital development. The Digital Principles were first created in consultation with organizations such as The Bill and Melinda Gates Foundation, the Swedish International Development Agency (SIDA), the UN’s Children’s Fund (UNICEF), UN Development Program (UNDP), the World Bank, and the U.S. Agency for International Development (USAID), and the World Health Organization (WHO). What does it mean to endorse the Principles? Why are the Principles relevant to my work? As the use of technology - from mobile phones and tablets to computers and UAVs - increases globally, so does their use in international development. More and more, technology is being integrated into service delivery across sectors such as education, health, agriculture, finance, and humanitarian assistance, amongst others. While these technologies have the potential to increase efficiency, cost effectiveness and impact across these sectors, there are still major barriers to ensure that their impact is fully realized. The Principles for Digital Development are a tool to help realize that full potential of ICTs. They offer nine specific best practices, each with a set of guiding questions, resources, and project lifecycle applications that will help you implement the Principles on your project. The goal of the Digital Principles is to use the hard-won knowledge of the community to make all of our projects better. As you learn new lessons through your own experiences, we hope that you will share them to help move everyone forward. Are the Principles listed in priority or process order? No, the Digital Principles are not intended to be implemented in any particular order. You can start with any of the Principles, depending on what seems most useful for your project. Or you can start with where you are in your project. Each Principle page includes specific questions to ask at each stage in a project lifecycle (Proposal, Design, Implement, and Evaluate). How can I use the Principles in my own work? The Principles can be useful in many different ways, depending on the specifics of your project or program. You can start by reviewing the Digital Principles Overview to learn more about them. Each Principle has a page on this website that describes it in detail, and offers related questions that practitioners can ask themselves at every stage in a project. The Principle pages also include featured resources to help you apply the Principles in your work. The Principles for Digital Development are designed to support a community of practice, so if you are working through a particular challenge, we encourage you to ask the community at the new Digital Principles Forum. This growing community includes practitioners, funders, government officials, and advocates, and they may have experience with similar challenges. What else can I find on the website, other than a description of each Principle? The website is an entry point to the community, where more than 800 development practitioners are sharing ideas and questions about digital development. The website also offers resources resources that are available to help you incorporate each Principle into your work, including case studies, toolkits, and how-to guidance. Who else is actively working on digital development? How can I reach them? There are thousands of people using ICTs for development around the world. The ICT4D community has over 800 members with a wide range of experience, including funders, implementers, government officials, and others. We invite you to join the community and explore the resources others have shared, ask a question, or share a useful tool. Are there conferences or other events where I can connect with other like-minded development practitioners? Check the events page, where we will provide updates about other ICT4D conferences that may be relevant to your work. And let us know if there is a conference that you think we should add to our list! Email us at PrinciplesAdmin@digitalimpactalliance.org. How can I share my feedback about the Principles or contribute a case study or other resource? First of all, thank you for your interest in contributing to the community! To share a resource, email us at PrinciplesAdmin@digitalimpactalliance.org. if you have a case study or resource that you think we should review and add to the website. You can also join the community and add your resource(s) there, so they are available to all community members.